Boyf has graduated from college! Hooray! Now he’s off to go make robots in the real world (by which I mean to say that he’s already done it in a less professional capacity and it carries rice and it is awesome), and I’m super proud of him. And speaking of the boyf, this month marks our anniversary, and since he’s pretty awesome, I decided to make something for him. 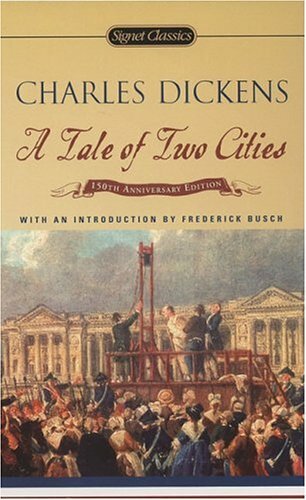 Alright, so I may altered that a little, but I still give credit to Charles Dickens. And actually, we didn’t have nothing before us; we had a giant slice (does it count as a slice if it was the whole small cake that happened to be giant slice-shaped?) of lemony goodness before us. I have never made a cake from scratch before. Once, years ago, my lovely friend Zab and I made a cake out of two boxed cake mixes. What we did with them was pretty much genius. Awesome, right? But let’s face it; they were still just cake mixes and our only contribution was a couple of ingredients and a moment of genius with a knife. But this day was different. This day, I decided that I was inspired (and by now the red warning light should be flashing). “By what?” you ask. “BY LOVE,” I would tell you, but I only write that in all capitals because it is late and I am tired and overly enthusiastic. I’m not even a cake person, that’s how inspired I was. And I wasn’t inspired to make just any cake, mind you. I decided that a two-layer raspberry and lemon cake with lemon cream cheese frosting would be a great first foray into the world of cake. That is, it was foolish enough that I am not going to be giving you the recipe for the raspberry portion of the cake. Call me crazy, but if the words “gummy”, “spongy”, and “ugly” can be used to describe something, I don’t think it should be shared. However, I will gladly share the recipe of lemony goodness. It may not make you want to participate in a revolution, but I’d like to think it’s better than discussing one with your high school English class. And please forgive the photography. It was late and dark and there was no pretty lighting to be found. 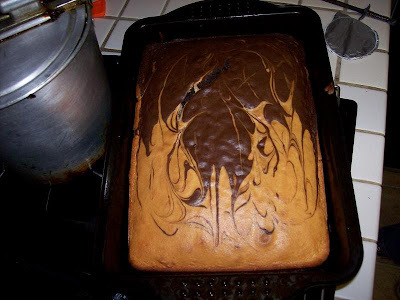 Preheat oven to 350°F (177.7 C) and grease a small cake pan (9”x9”). Remember, this cake ends up pretty small, which is great if you want cake and a big cake would be too much, but is not so great if you’re hosting a party. Play with proportions as you must, and remember that when doubling a recipe, double everything except the spices—be more carefully with those. In a large bowl, beat butter and 6 T white sugar for five minutes or so. Add the buttermilk, lemon juice, lemon zest, and vanilla. Keep mixing. Add dry mix to wet mix and combine thoroughly. In another separate bowl (sorry! ), beat the egg whites and cream of tartar for a few minutes, “until soft peaks form”. When you pull your whisk from it, there should be a point remaining whose tip falls and leans to one side. Beat in the remaining 1 ½ tablespoons of white sugar and keep whisking until medium peaks form. This time, when you pull your whisk away, the iceberg tips should be more solid. Fold the egg white mixture into the big bowl and spread into the cake pan. Bake for 25-35 minutes, until a toothpick or the tines of a fork come out clean-ish (by which I mean not wet or totally covered in cake). Allow to cool and go make your frosting. Beat the cream cheese and lemon zest until combined. Add powdered sugar one cup at a time. The texture will be according to your personal preference. Add a tablespoon of lemon juice and keep mixing. If it’s too runny, add more powdered sugar. If it’s too stiff, add a TINY BIT more lemon juice. Now, I removed the cake from the pan as soon as I felt it was safe, and let it cool. Then I cut it into fourths and frosted each piece, slapped them on top of one another, and frosted the whole thing. Throw a slice of lemon on top and voila! You have a mega slice of cake. Of one cake. Please ignore the ugly raspberry thing sitting on top of the trash can. This successful lemon cake is best enjoyed with a Carton of milk or Monseigneur’s chocolate and a good book. Have you ever seen the movie Chocolat? 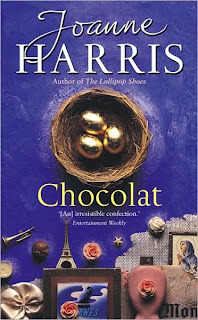 It is one of my favorites of all time, and in fact I want to step away from my laptop this very second to watch that story of a small European town turned upside down, of chocolate and its almost magical composition, of insistent winds that carry you away to the new and sometimes far away from the old. Plus, Johnny Depp as a River Rat is quite compelling. After I’d seen the movie a good eighty or ninety times, I decided that I needed to read the book upon which it was based, written by Joanne Harris, and it is… sometimes breathtaking. It is sometimes exactly the same as the movie I love, in that quiet, rebellious sort of way. And yet it is something altogether different, giving Vianne a deeper uncertainty, a bigger struggle, a harder love life. I often wonder how I’d feel if I’d read the book first (I’m oftentimes a purist about things like this), but having watched the movie first, I can tell you how much I love both. 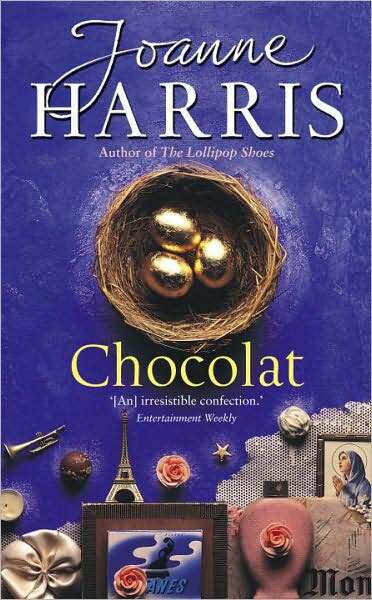 I read the sequel, The Girl With No Shadow, shortly afterwards; it was compelling and emotional but different from Chocolat, but I’m glad to have read it. I realized immediately that I needed to read more by Joanne Harris, and so I found and bought Five Quarters of the Orange. 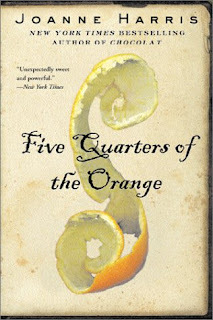 Looking back (I read it about two or three years ago), I find myself remembering the shocking violence and cruelty of Five Quarters of the Orange (unlike Chocolat and The Girl with No Shadow), as well as the prominence of food as both plot points and symbolism (exactly like the other two). It’s a coming of age story, but unlike most I’ve read. I also bought another of Harris’ novels, Blackberry Wine. I have it here somewhere, and I know I have to read it soon. And guys? This recipe is easy. Like super easy. Trust me, I’m only fooling you into thinking I’m brilliant (I hope). And yes, that does say "orange soda cupcakes". These are genius, and a slight variation of a recipe I found in a Martha Stewart cupcake cookbook. Plus it's fun that they bubble. Preheat oven to 350°F (177.7 C) and put cupcake liners into your muffin tin (okay, I actually use free-standing silicone cupcake liners with paper liners inside them). In a mediumish bowl, beat all the ingredients together on low (30+ seconds) then medium (2+ minutes), scraping the bowl occasionally. Make the frosting and glaze (see below). Bake for 20-25 minutes, until a toothpick (or fork or skewer or something) inserted in the middle comes out clean. Place on cooling racks. Beat butter until it’s light and oh so fluffy. Add the rest of the ingredients, beating until mixed. If it's not fluffy enough, put it in the fridge for a bit, then beat again. Wait until the cupcakes are cool (Do it!! I did not and I regret it.). While they cool, you can put the frosting into a bag. My favorite method is to put a bag into a coffee mug, fold over the edges (so you don't get frosting on the zipper), and scoop the frosting in. Cut off a small corner of the bag and frost! Mix all ingredients with a whisk or a fork. Let cool in the fridge. Drizzle over frosting on top of delicious cupcake. They are best enjoyed with blackberry wine and a good book. Hello! Welcome to (what I hope is) my lovely blog! I would take you on a grand tour, but my boyf/webgoblin has made it so easy to navigate that I’m sure you’ll have no trouble finding what you need. Look! There’s even a pretty search bar! And a Recipes page! And a contact form! …in a moment. First, I want to talk about Game of Thrones. Like so many other people right now, I’m reading the books. I haven’t watched the series (yet), but I can assure you that I am mesmerized by these books. 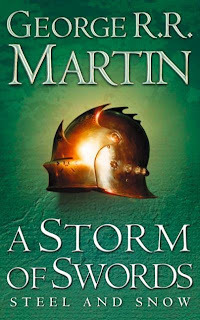 The sheer complexity of the characters and plot is enough to make me respect George R. R. Martin, and I’m only partway through the series. One of my favorite characters is Tyrion Lannister. The Lannisters are supposed to be golden, beautiful, cold, and talented, and they “always pay their debts”. But Tyrion was born a twisted dwarf, and it’s difficult for anyone to look past that at the extraordinarily intelligent man standing there. The interesting thing about Tyrion is that he isn’t a good guy, but he isn’t a bad guy, either. I’m really curious to see if he ends up on one side or the other… or if he’s going to die first (I’m learning very quickly that Martin has no qualms with killing any character, no matter their importance or surrounding plot). Anyway, I've decided to base my first recipe on Tyrion Lannister. And it's shortbread. Because he's short. And it's golden. Because he's a Lannister. I altered this recipe from a cookbook my grandparents bought for me, called The Back in the Day Bakery Cookbook. I’m not very good at following recipes, and yet I share and expect you to follow mine? Let’s just ignore the hypocrisy of that idea and pretend that I actually have a master plan as intricate as one of Tyrion’s. In a largish bowl, beat together the butter, vanilla, salt, lemon zest, and lemon juice on medium speed until smooth and creamy (a minute or so). Turn the speed to low and add the powdered sugar. Beat until light and fluffy (another couple of minutes). In another bowl, mix together the flour, ginger, clove, cinnamon, and nutmeg. Add the flour mixture to the butter mixture a bit at a time, and stop mixing when it’s fully incorporated! Overmixing is bad. Don’t do it. Just say no. Move your chunk of dough into another bowl (the flour bowl, so you have less dishes to wash), and use your hands to make sure all the dry bits from the original bowl are properly mixed in. Form cookies from balls of dough equal to about a tablespoon or two (remember, just keep them consistent! ), and keep them an inch apart on the cookie sheet. Flatten the cookies with a cookie stamp, the bottom of a cup, or the heel of your palm. In a plastic baggie, pour the white sugar and the remaining ground ginger into a bag and shake it up until you have delicious ginger sugar. Sprinkle it all over your flattened cookies. Refrigerate (30 minutes to 3 hours) and do the dishes! Preheat oven to 350˚F (176.7 C). Grease your cookie sheet(s). Bake in the lower part of your oven for 8-10 minutes, until the edges are as golden as a Lannister’s light hair. Rotate the cookie sheet(s) halfway through baking. Let cool on a wire rack, and store in an airtight container. Or eat immediately. They are best enjoyed with a sweet plum wine and a good book.